Adaptive Skin has created an hole in your zSphere mesh? I like to build coarse shapes and then carve and retouch them later, so I usually start with a simple zSphere chain and try to approximate the reference image. This is something I always do, unless I can place the real object next to me on the desk. Sometimes, however, when you build a mesh with zSpheres the Adaptive Skin will leave an open hole. Doesn't seem a big deal, but in the images below you can see it makes a lot of difference. 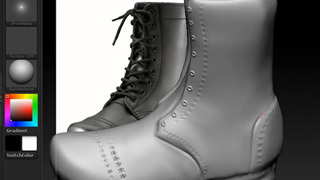 Just look at how the boot's basic shape looks like, using classic skinning, both with and without the extra zSphere added. Just alt-click a root zSphere to delete it and see the difference. Daniele is one of the world's few Pixologic-certified zBrush instructors, he has a PhD in Biology, but his real passion is sculpting. He has developed concept art and models for games and video productions and has taught digital sculpting at the world renowned Academy of Fine Arts of Brera in Milan. He has always denied all rumors about his "I Love Wacom" tattoo.